Be the first to share your favorite memory, photo or story of Rogelio. This memorial page is dedicated for family, friends and future generations to celebrate the life of their loved one. 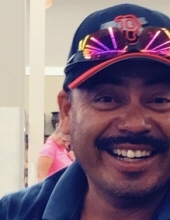 Rogelio Castellanos 45, died Wednesday, February 6, 2019An open visitation will be held from 8am-7pm, Saturday, February 9, 2019 at Harper Funeral Home. The Funeral Service will be at a later date in San Carlos, Coahuila, Mexico. Survivors include his wife Yadira Castellanos and children Bryzeida, Brayza, Bryahna, and Rogelio, Jr.
"Email Address" would like to share the life celebration of Rogelio Castellanos. Click on the "link" to go to share a favorite memory or leave a condolence message for the family.